Caption A taste of Hong Kong returns to San Francisco Chinatown as the annual Chinatown Night Market Fair starts another six month run. Chinatown's Portsmouth Square in transformed from a park into a marketplace of bargains entertainment and arts. The similarity to Hong Kong is uncanny. On some occasions there is so many people you can barely move. The Chinatown Night Market Fair is giving a much needed boost to the ailing Chinatown economy. The Chinatown Night Market Fair was created with the help of the Mayor's Office after 1989 earthquake. Due to the earthquake the Embarcadero Freeway was demolished in 1991. The loss of the freeway caused visitors to the Chinatown area to dwindle even further. 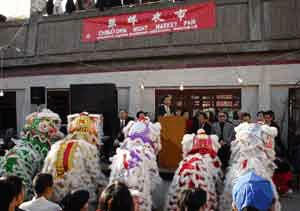 To revitalize Chinatown the Night Market Fair was created. From the looks of it it is succeeding very well. Headline JUL-NOV: A late night taste of Chinatown.